The Greenville Swamp Rabbits beat the St. Louis Browns, 6-4, at Michigan & Trumbull. Robert Moore was recognized as player of the game for his performance. He was 2-4 with 2 home runs. He drove in 4 runs and scored twice. The former first round draft pick was a menace to St. Louis all day. Walt MacKey, credited with the save, is now 20 for 20 in save opportunities. Greenville, now 39-32, holds third place in the Continental League Eastern Division. 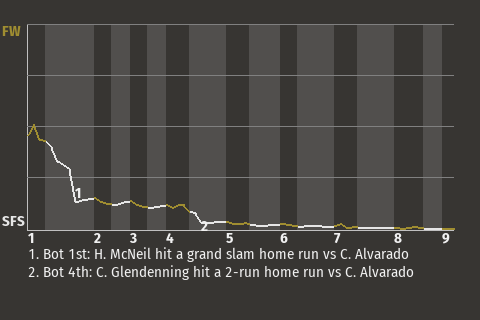 Moore had a game-changing home run in the bottom of the eighth. On a 2-2 fastball from Ray Reyes, he banged a 2-run home run to right-center, giving the Swamp Rabbits a 5-3 lead. It was the 18th home run of the year for Moore. "This kind of win will certainly make our fans happy," Moore told the Greenville Times.